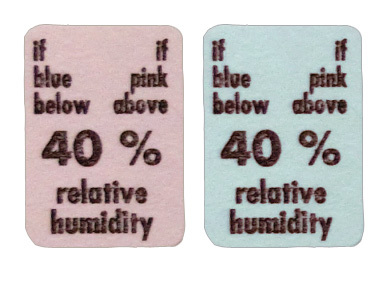 Colour shift from blue to pink at 40% RH. To stick to a desiccant bags or iattach nside your packing. It shows you if your desiccant bag is saturated or not. Don't store longer than 12 month, as adhesive will degrade. 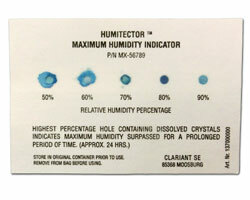 As humidity changes, the chemically impregnated spots change from blue (dry) to lavender (normal) to pink (humid). 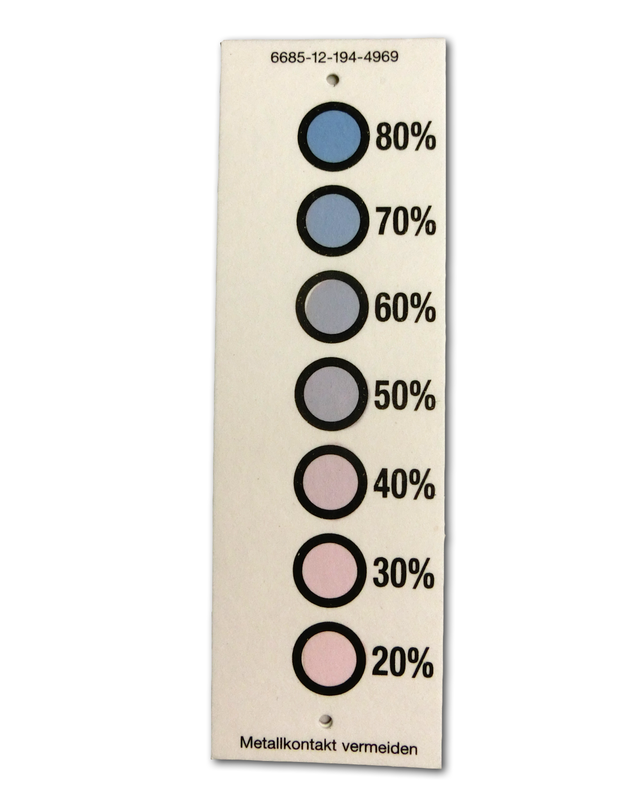 The most neutral coloured spot (grey) indicates the present RH, with a precision of ±5% at 20°, within 5 hours (precision in practice around 10% RH). At higher or lower temperatures, 5% RH must be added for each 10°C above 20°C, or deduced at temperatures below 20°C. Avoid metal contact. 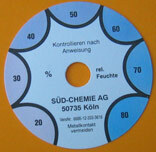 Size: 160 x 50 mm. Cobalt free - based on copper salts. Colour shift from brown to azur. From 250 strips: packed in metal cans with desiccant. Cobalt cholride free - based on cobalt bromide. Colour shift from blue to pink. From 200 strips: packed in metal cans with dessicant. From 500 strips: packed in metal cans. 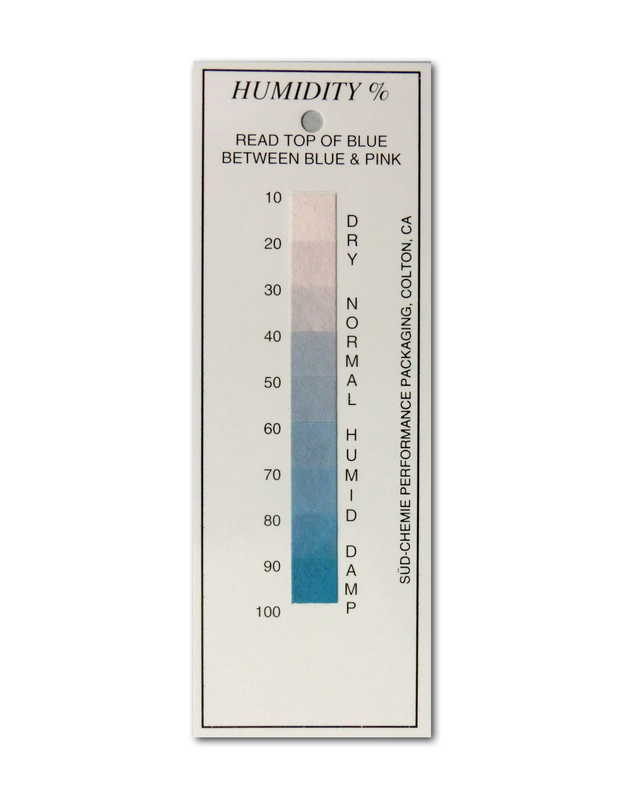 The colour spots irreversibly start to run if the relative humidity exceeds the indicated value for longer than 24 h (like on the picture the colour points 50% and 60% RH). Sealed individually along with a smal desiccant bag. 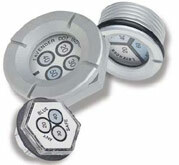 Humidity indicator plugs are designed to inidcate the relativ humidity level within non-tranparent packages without users having to open it. They can be screwed into the outside walls of the package and feature large, clear viewing windows for easy reading of humidity levels within the container.